The new standard was developed jointly by the False Alarm Reduction Association (FARA) and the National Electronic Security Alliance (NESA). The standard covers: Definitions, Central Station/Monitoring Facility Procedures, Video Quality & Storage, Installation and User Responsibilities. 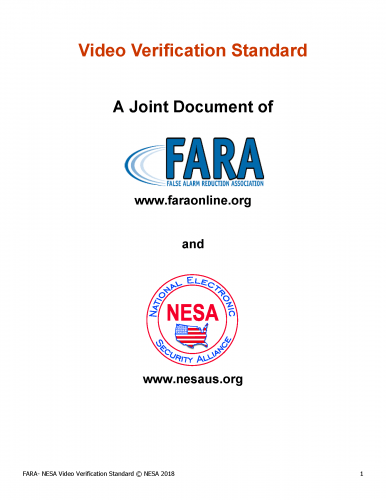 FARA & NESA hope to provide guidance for the responsible and effective use of video to attempt to verify alarm dispatch requests. By developing standards we hope that unnecessary dispatch requests can be reduced. Click here to download the free standard.